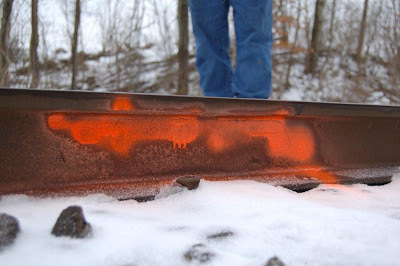 I've included a shot of what a rail defect looks like. I have had a number of questions recently about what we look for out here. This is a Split Web-Open Rail (as opposed to a joint). it ran up to the head, then started into a Head-and-Web separation. a real nasty bugger that was just lying in wait to snap under one of the beloved M636's. Luckily, we found it first!!! ROANOKE, VA. – Norfolk Southern Corporation has offered a challenge grant of $1 million to the Virginia Museum of Transportation (VMT) for capital and operating expenses over a three-year period to help the museum implement certain recommendations from Museum Management Consultants. The challenge grant is contingent on equal commitments of support by both the governments of the Roanoke Region and by other private donors to meet the estimated $3 million required for the museum’s long-term needs. Norfolk Southern also will assist museum staff in drawing up a three-year business plan and establishing measurable objectives to restore the museum’s vitality. In addition, other local rail-related organizations including the Norfolk and Western Historical Society (NWHS), the Roanoke Chapter of the National Railway Historical Society (NRHS), and the O. Winston Link Museum have offered their support for the effort. The proposed three-year plan would implement many of the consultant’s recommendations: re-evaluating and redefining the museum’s mission, vision, and core values, and establishing priorities, accountabilities, financial milestones, and timelines. The plan would result in strategies addressing exhibits and the visitor’s experience; focusing the collection of rolling stock, documents, and artifacts; shaping the governing board to involve more leaders from the community at large; developing the professional staff; and funding for sustained operation. The Virginia Museum of Transportation is Virginia’s official transportation museum as designated by the General Assembly of the Commonwealth of Virginia. It is one of the largest rail museums in the United States with a varied collection of rail equipment, including the world-famous Class J 611 and Class A 1218 steam locomotives. Note: Click on a picture to see it enlarged. Then use your Back button to return. 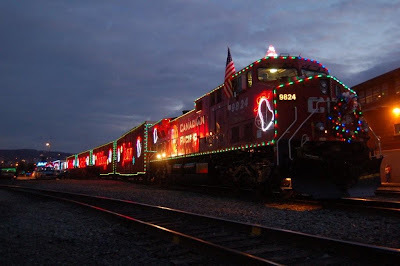 Tis the Holiday season...and the day after Thanksgiving marks the start of the annual tradition known as the Christmas (for all us non-pc types) or Holiday Trains. We saw two in the Scranton PA area yesterday. 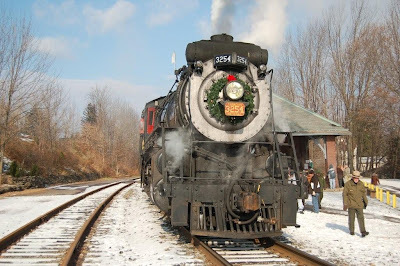 Steamtown used the 3254 to Moscow (so Putin could tell Santa he wants Poland and Eastern Europe for Christmas...J/K)..While the CP Holiday Train was on display in Scranton, then headed west to Binghamton, NY. 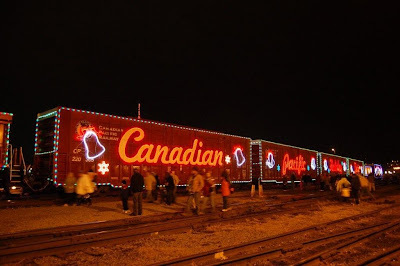 Good friends, good trains, cold weather, cheaper gas ...what more can we ask for this season of remembrances??? so, let me be the first to wish everyone a Very Merry Christmas!!!! Received the following from Kermit Geary, Jr. Text, pictures, and captions are his. Action on Black Friday on the Delaware Lackawanna included the movement of 3 locos from the grain mill to Scranton. White Snow, ALCOS, Black smoke, Good Friends...can life get better??? NORFOLK, VA. – American Honda Motor Company, Inc. has awarded Norfolk Southern Corporation, in competition with all assembly plant and port locations shipping Honda vehicles, the 2008 Performance Excellence Award for Rail Origin Carrier of the Year for service provided at their Lincoln, Ala., automobile manufacturing plant. The award recognizes transit performance, inventory control and empty rail car supply, and audit performance. 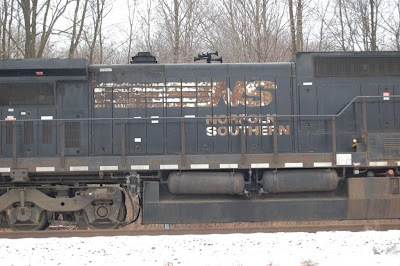 Norfolk Southern began its service to the Lincoln plant in 2003 when the construction of the rail-served vehicle loading facility was completed. “Norfolk Southern is honored to receive this award, which recognizes the hard work and dedicated efforts of the NS team during 2008 in delivering superior service to Honda, one of our major automotive customers, and we are committed to continuing to provide excellent service in the future,” said David Julian, NS president, automotive and supply chain services. Following information was derived from an email we received. There is a rare celestial event currently visible in the early evening. Very close to the crescent moon you can see both Venus and Jupiter. The moon will, of course, be brightest followed by Venus and then Jupiter. Look to the southwest, near the hoizion. This was first visible, I believe, on Monday evening; and this should be visible the rest of this week. Only problem is, it has been cloudy here in New Jersey this week. This particular alignment will not occur again until November, 2052. Some technical information in the email. "One neat thing about this is to think VERY three-dimensionally, and understand that the plane of Jupiter and Venus is the same plane that the Earth is on. And you can sense that the earth must be tipped away from the sun on that plane, as it is, being near to the winter Solstice. And further (appropriate word) you can grasp that Venus is not so far away, given its relationship to Earth and the Sun, but for Jupiter to be visible in that alignment is impressive, as it is all the way over on the other side of the solar system." Now consider this for a photo opportunity using a timed exposure to get the heavenly bodies. Again from the email. "Imagine recording a twilight silhouette photo the next couple of evenings of an idling SD or Dash-9 (or signal bridge) with these celestial bodies looming above them?! Won't get that shot again in our lifetimes." Recieved the following via email. NORTH KANSAS CITY, MO. – On November 13 Norfolk Southern completed the installation of a 50 kilowatt wind turbine at its rail yard in North Kansas City to power the yard’s wastewater treatment plant. The wind turbine consists of three 24-foot rotor blades mounted on a 100-foot tower and is estimated to generate more than 100,000 kilowatt hours annually. Norfolk Southern brought its first wind turbine on line in 2007 at Bellevue Yard in Ohio. Both wind turbines, supplied by Entegrity Wind Systems of Boulder, Colo., produce at least enough power to offset the electricity consumed by the pumps and controls of the yards’ wastewater treatment plants. These plants collect and treat the water used at maintenance facilities as well as rainwater runoff. For more information on Norfolk Southern’s sustainability efforts, visit http://www.nscorp.com/footprints/. Following article is from the Courier news dated 11-18-08. 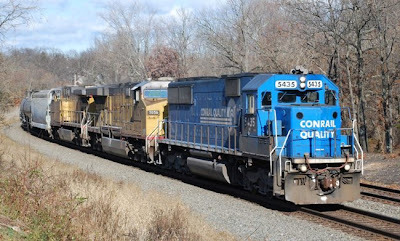 Officials have decided to hire an engineering firm to study the creation of a quiet zone for trains in the Neshanic Station section of the township. Residents near the crossing at Lehigh Road have pushed for a muffling of horns that commercial trains sound as they pass through. Deputy Mayor Jim Leonard said the committee on Nov. 10 approved a recommendation from a subcommittee studying the issue to hire a consultant that would investigate the project and its costs. At a cost of $5,000, the township is bringing Maser Consulting on board, according to Leonard, who noted that the planning, design and construction engineering firm was involved in the establishment of four quiet zones in nearby Hillsborough. "They looked at a bunch of different groups, but in the end, they decided it would be best to have someone who has done it in the past and can help us with the maze of bureaucracy and the identification of the costs," Leonard said. 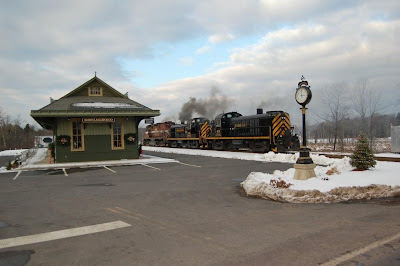 Towns can establish quiet zones near train crossings by setting up additional safety features such as corral-like devices or raised medians that would replace the need for the horns. Leonard said the firm hopes to have a draft of its study completed by the end of the year, adding that the firm plans on making a presentation to residents during a Jan. 26 township committee meeting. Resident Karina LaMalfa is part of a neighborhood committee that has advocated for the quiet zone's creation. She said they have been looking into the issue for more than two years. During the last five years, the frequency of passing trains has increased to as many as 20 to 28 per day, LaMalfa said. "Although some of us have grown very accustomed to it, there are people in the neighborhood for whom it's a huge problem," said LaMalfa. "We have older people who aren't sleeping as well as they could be, we have people who have illnesses who are supposed to be home recuperating and resting during the day, and they're just unable to." LaMalfa said the crossing is also below safety standards, with emergency vehicles often having to avoid the crossing to avoid being stuck. Residents are also willing to chip in for the improvements, according to LaMalfa. "There will always be types of noise that will irritate or bother some residents in some areas. What we realized as a committee that we needed to do is that we needed to step up for a majority of the equipment," said LaMalfa, mentioning the signal improvements and signage. She said residents hope the township can fund needed roadway improvements. however I am not talking about autumn's foliage but some of the motive power I saw along Saturday's frigid trackside trip. 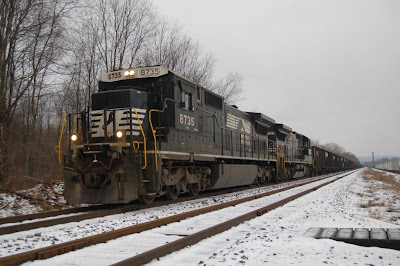 First off was a rolling meet between NS 24V and NS 21M at Flemington Jct that I saw through the trees as I was driving. Decided that I would wait along River Road where I had the sheltered comfort of my truck to stay warm as the wind was brutal at times. 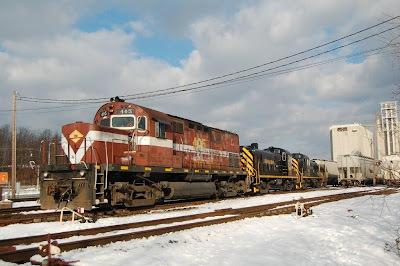 My patience and perservance paid off as I managed to photograph a very colorful trio of motive power on NS ethanol train 68Q. PRR 5435 (EMD SD50, ex-CR 6765) was the leader, followed by UP 7056 and UP 7172. After that passed, decided that I had enough of this cold windy morning and started for home. My drive took a detour at Three Bridges where BR&W's 1202 was switching some cars. Their switcher looked like an ex-Reading unit with its clean green and yellow paint scheme, very nice! Despite the lack of trains, it was more quality than quantity on this Saturday morning. As a footnote regarding the Port Reading Junction track realignment project, the block signal west of the Raritan River bridge is no more! This was the signal that would indicate if a westbound train was heading west over the Lehigh Line or down the Trenton Line. 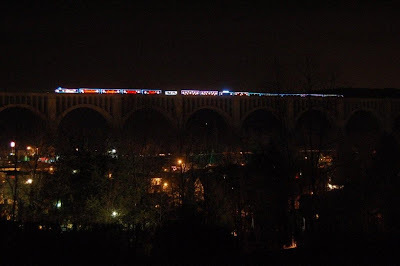 Evidently it has been replaced by two dwarf signals near the west side of the bridge for westbound trains. Don Barnes is a retired commercial jet pilot and model railroader. He flew for USAir and was certified on everything from DC-3s to 767s...and he likes steel-related railroading! He has a terrific HO layout in one of the former PRR CONGRESSIONAL stainless steel passenger cars he has on display at the Harlansburg Station Transportation Museum that he maintains at the intersection of U.S. Rt. 19 and PA Rt. 108, south of Mercer and east of New Castle, PA. As information, PA Rt. 108/Harlansburg Road is Exit 105 on I-79, and U.S. Rt. 19/Perry Highway is Exit 15 on I-80. Don's layout has a steel mill and lots of yard, industrial and urban scenes. Much of the rolling stock and steam and diesel motive power reflects the PRR and P&LE trains that Don saw so much of while growing up near Pittsburgh, but he also wisely has B&LE F7s and early SDs on the layout and in his 15-stall roundhouse. His fascinating and neatly-arranged museum displays also contain extensive aircraft and aviation history exhibits to also enjoy. 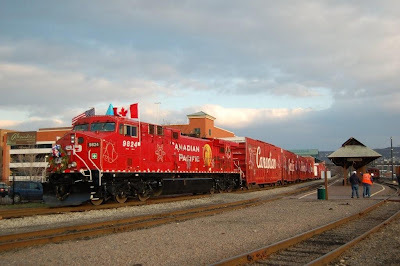 Even beyond trains and planes, his exhibits also highlight cars, trucks and motor coaches, plus he has a maritime museum. He has an incredible amount of 'stuff' there that I had no idea even still existed! NORFOLK, VA. – Norfolk Southern Corporation (NYSE: NSC) has been named one of the nation’s best employers for people with military experience. G.I. Jobs magazine ranked Norfolk Southern among the top 50 military-friendly companies for 2008. The annual list recognizes companies that have made the greatest effort and had the greatest success in hiring military veterans, and that have the best policies for Reserve and Guard members called to active duty. This is the third time Norfolk Southern has earned a spot on the list. 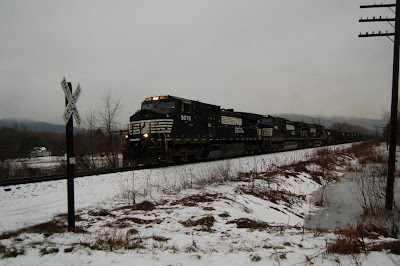 Norfolk Southern actively recruits people with military backgrounds for careers in railroad operations and management. During 2008, NS has recruited more than 400 veterans as new hires, 20 percent of all new employees.